Actress of many names -- aka Virginia Pound, Adrian Booth. She was a workhorse in the lower levels of cinema at the time -- she did Columbia serials and comedy shorts, including work with the Stooges; Westerns at Republic, cheap actioners at Monogram. 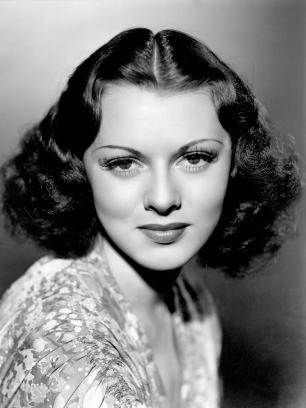 From 1937 to 1951, she made 69 films, including roles as: the lovely lady in need in the Three Mesquiters' (including John Wayne) "Red River Range" (1938), Boris Karloff's daughter in "The Man They Could Not Hang" (1939), Mattie Herring in the Stooges' "You Nazty Spy!" (1940), Queen Vultura in the well-regarded jungle serial "The Perils of Nyoka" (1942), the love interest in the very first "Captain America" serial (1944), the heroine of "The Daughter of Don Q" (1946), and a noir villainess in "Hideout" (1949).